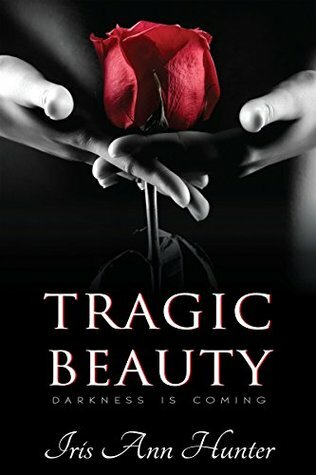 ‘TRAGIC BEAUTY:’ A dark full length novel, the first book in the ‘Beauty & the Darkness’ trilogy by ‘New to me’ Author Iris Ann Hunter. The opening chapter sees twenty-one year old Ava standing by her fathers newly dug grave, he’d been given a year to live but he’d outlasted that by five. Now that he’s gone she fears what is to become of her. And she’s about to find out that same day she buries her father, her hand is being forced by the devil, a man obsessed with her since they were kids, he’s given her twenty four hours and then she’s finally his, and he will stop at nothing to claim her, to break her, to make her bleed, to make her his. At just twenty three years of age, he's a man to be reckoned with, he's rich, powerful, a man that will destroy ayone who gets in his way of claiming Ava. She’s got just one night of freedom, she dresses up and makes her way to a nightclub using a borrowed car, knowing she needs to be back before her time is up, along the way her car breaks down on a deserted road, it’s pouring down with rain, a kind stranger picks her up and drops her off at a near by garage to use a pay phone but his conscience gets the best of him and he comes back and takes her back to his place. For me this is where all the feels came in the story, I was lulled into a false sense of security, having high hopes this man would save her, but a few pages and all my hopes are shattered and like the heroine I’m thrown into a world of darkness. I hated him, I wanted to kill him with my bare hands, I raged, but then when he reveals his childhood and I cried..
God this was such a crazy, dark, gritty, sick, sad story, heed the warnings tagged when it comes to this book because I don't say this lightly but this will be very dark for some, it will cause triggers, it will push your comfort zones like no other book, when you think the author can't go any darker, she does, nothing is glossed over, it's full out in your face, you have nowhere to hide. If you're just stepping into the dark genre this book isn't for you. And yet again I don't say that lightly. Heed the authors warning and my own. You have been warned!! I was sixteen when I made the deal. When I put my fate in the hands of Shayne McAllister, a man determined to break me. A man with black eyes and a blacker heart, who’s been obsessed with me since we were kids. And now that my father has passed, he’s coming to collect his debt. But before I become his, I see a chance to make a choice for myself, and I take it. I slip away, for one night. One dark, stormy night that goes horribly wrong. Until a stranger crosses my path. An angry stranger, with a harsh voice and menacing eyes, who grants me one night. One messed up, beautiful night, that changes everything, and spares no one. Because the stranger wants more. More than just one night. A darkness where secrets will be revealed, blood will be shed, and sacrifices made. Iris Ann Hunter is the Amazon Bestselling author of Tragic Beauty, her debut novel. Drawn towards the tortured, sometimes brutal side of human nature, she writes dark, twisted stories that explore the shadowy side of love and lust. As a child, Iris grew up with a love of books and a passion for writing, but it wasn’t until later in life, after working as a horse trainer, truck driver, and graphic designer, that she decided to pursue her dream to be a writer. She lives with her longtime lover in a seaside town along the Southern California coast. Iris is currently at work on the second book in the Beauty & The Darkness Trilogy, Hunted Beauty.